The Best Exotic Marigold Hotel was a real treat! It follows seven British seniors who are also strangers to one another as they leave England destined for the supposedly posh Best Exotic Marigold Hotel for the Elderly and Beautiful in India. However, they are in for a rude awakening when they arrive. Not only do they experience the culture shock of India and it’s massive crowds, but the hotel is NOTHING like the brochure describes! I laughed and felt bad for these poor seniors because I would freak if that was my hotel. One senior had no door on her room because who needs a door right? Another senior discovered a flock of birds in her room. The phones didn’t work and the plumbing was old and leaky. The young man who was the manager/owner of the hotel was hilarious! He had such a positive attitude and tried to turn all of these faults that were pointed out to him into something good. He mentioned a saying that was repeated a few times throughout the film that goes something like this: “Everything will be right in the end. If it’s not right, it means it’s not the end”. He used that a few times to justify the state of repair of the hotel. Each character has their own story. There’s the woman whose husband died and is searching for her way in the world and the man who returns to India to be close to the man he fell in love with many years before. My favourite character was the crochetedly older lady who went to India for a hip replacement. I loved watching her transformation in the movie. She has a hard exterior but inside she does have a good heart. Another aspect of the film that fascinated me was learning about the way of life in India. It is so different than what I am accustomed to! I remember learning about India in my geography class in high school and this movie touched upon a few things like the caste system and the Untouchables and the Hindu funeral service. They also showed how the exotic food affects people who aren’t used to it and even the smells are foreign! I loved The Best Exotic Marigold Hotel. It made me smile and laugh and want to travel to India! Check out this video of the Spice Goddess making Butter Chicken! I want to see this film! It looks so cute and has a great cast! I’ve seen this movie twice now. I love it! i put this on hold at my local library and am picking it up on Saturday. If I really like it, which I suspect I will, I am going to buy it. I plan to watch it with another prize I won, which I only entered because it had to do with India. It is the promtional prize that was offered when this was in theaters….a beautiful white bathrobe that is embrodered with The Best Exotic Hotel in gold and spices from India. I loved the prize and can’t wait to see this movie. There are to places I want to visit in my life….India and I want to see the Giant Red Wood Sequias out West. Maggie Smith AND Bill Nighy!!? AWESOME!!! Sounds like an adorable movie. I saw this movie when it first came out and I thoroughly enjoyed it…I am a true fan of British actors and this movie had so many of my favourites. Dame Judi Dench was wonderful as always but so were all the others. 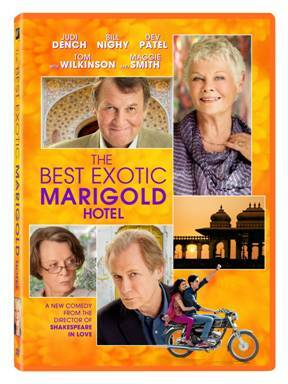 I would recommend The Best Marigold Hotel to everyone, for me it has become a fave and I will have to get the DVD. this movie has some of my favorite actors of all time in it and I cannot wait to see it.